ELIGIBILITY: Open to all USA Swimming clubs and registered athletes. If your club would like an invitation to this meet please contact the Meet Director. This meet has no qualifying times. Athletes shall compete at the age attained on the first day of the meet. An athlete may only compete in his or her own age division. Entries limited to 1st 4000 received. RULES: Current USA Swimming rules shall govern the meet. All events are timed finals. A contestant may enter no more than four individual events per day. No on-deck USA-S registrations will be permitted. INCLUSION POLICY FOR SWIMMERS WITH A DISABILITY: PVS and host clubs along with their Meet Directors are committed to the Inclusion Policy as adopted by the BOD. Athletes with a disability are welcomed and are asked to provide advance notice of desired accommodations to the Meet Director. The athlete (or the athlete’s coach) is also responsible for notifying the session referee of any disability prior to the competition. 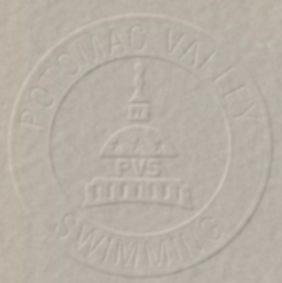 WARM-UP: The prescribed Potomac Valley Swimming warm-up procedures and safety policies for Open warm-ups will be followed. TIMERS: Participating Clubs are required to provide timers in proportion to their entries. The Deck Meet Director will determine the number of timers per club and lane assignments. The Host Club is required to provide one timer per lane. OFFICIALS: All certified officials wishing to volunteer to work this meet please contact Lynne Gerlach at lgerlach@msscswimming.com prior to April 26. Please include your club affiliation, certifications held, and sessions you wish to work. Officials assigned to this meet should sign in at the recording table at the start of the Warm-up. Certified officials, who have not been contacted, should volunteer their services to the Referee. SUPERVISION: Coaches are responsible for the conduct of their swimmers and for cleaning up their team areas. ADMISSION: There is no admission charge. Programs for each session will be available for $2.00 each. Working officials and coaches receive a free program. FEES: Fees for individual events are $5.00. Remit one check to cover the entry fees for the entire team. Do not send cash. Telephone entries will not be accepted. Deck entries will be accepted for a fee of $10.00 per entry. No extra heats will be created to accommodate deck entries. Deck entries will close for the morning session at 8:30 AM and in the afternoon session at 1:00 PM. Evidence of current USA-S registration will be required for deck entries. This can be done by presenting a copy of the athlete's USA-S registration card. AWARDS: Ribbons will be awarded for 1st through 8th place in the following age groups: 10&Under, 11-12, 13-14 and 15&Over. ENTRIES: Short course entry times will be considered conforming times for this meet. Long course entry times must be designated with a capital letter "L". These non-conforming times will be seeded after short course times. Club entries will be accepted by email. Submission of entries by email must include the following files: the Hy-Tek Commlink II file, The Team Manager Meet Entry Report files (one by SWIMMER and one by EVENT) and an "Entry Cover Sheet." The name and phone number of the Club representative submitting the email must be included. INDIVIDUAL OR UNATTACHED ENTRIES WILL ONLY BE ACCEPTED BY delivery to the house address below and will not be accepted by e-mail, unless those swimmers are training with a club and that club is submitting their entries in the required above Hy-Tek format. Clubs submitting by email may submit entries to entries@msscswimming.com, in the subject heading type, "2008 EARLY BIRD LONG COURSE - ****" with the club's initials substituted in place of the asterisks. Optional: Before preparing your entries, events for this meet can be downloaded and then imported into team manager. (download "50mm050308.zip" ) and then go to team manager/file/import/meet events to import events. Meet Directors are requested to acknowledge receipt by return e-mail within 24 hours. Clubs submitting entries that do NOT receive an acknowledgement should contact the Meet Director by other than e-mail to confirm receipt. WARNING: Any Club that enters an unregistered athlete, falsifies an entry in any way, or permits an unregistered coach to represent them, will be fined the sum of $100.00 and no further entries will be accepted from that Club until the said fine has been paid. NO LATER THAN 5:00 P.M., TUESDAY, April 22, 2008. Important: The above date is the deadline for clubs to submit their entries. Therefore, clubs usually set an earlier deadline to receive entries from their swimmers. Check with your club for this information. 2) Positive check-in 200 and over events. Should a change occur, all participating clubs will be notified by email. NOTE: 10 & U and 11-12 Events will be swum combined. Meet Director reserves the right to break them out into separate sessions.